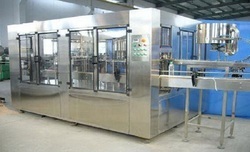 All Pack Engineers is the leading manufacturer for water bottle filling machine. Which is regularly use to fill mineral water in pet bottle, Machine is easy to operate and maintain, we are providing one year replacement guaranty with our machine. Our organization is one of the recognized names engaged in offering 24 BPM Mineral Water Filling Machine. These machines are manufactured using quality assured parts and components that are sourced from the reliable vendors of the market. Moreover, the offered machines are tested on various parameters so as to ensure their adherence with quality standards and norms. This machine is better then 40 Bpm machine. Machine can run 20 Hours in a day, maintenance of this machine is 250 Rs./lacks of bottles. Easy to operate. This machine does not require any skilled operator.